Aled Jones visits Port Talbot, home of Britain's largest steelworks, as 4,000 workers and the wider community await news of hundreds of redundancies. Browse content similar to 28/02/2016. Check below for episodes and series from the same categories and more! and the wider community await news of hundreds of redundancies. My fears are for the young people who are currently employed there. They've got mortgages, they've got young families. It's going to be devastating. Absolutely devastating. life-threatening accident at work was galvanised by his male voice choir. where I'm almost like being back in work. out more about St David, patron saint of Wales. -as well as a shampoo and set. -Make sure you do a good job! including from the Land of Song. It would be rude not to, wouldn't it? almost 55 years ago, Songs Of Praise was first broadcast. swept across Port Talbot, there now emerges the Abbey steelworks. tens of thousands of workers. a real concern for the people of Port Talbot. We don't know what's happening yet, so we'll just wait and see. -Bad, isn't it? really bad. Personally, I think it'll be, Port Talbot will start to die again. is estimated to be losing £1 million a week. affected in the coming months. Port Talbot has been synonymous with steel for more than 60 years. You can see why. It's such an imposing and impressive presence here. 750 of the 4,000 workers are at risk. who can see the blast furnaces from his home. There's no getting away from work for you. -You practically live in the steelworks. I can look out my window and I know exactly what's happening. What does that place mean to you? part of my family's life. My grandfather worked there, my father. and long may it continue, yeah. without realising, maybe, will own some steel made there. Your fridges, your microwaves, your car. You know, we make the finest quality steel in the world. You can tell that you're really, really proud of what you do. and I'm proud of the works, of the plant. How have you managed not to be too down about what's happening? and God willing, I think that we will prevail. -Have you turned to your faith at all during these difficult times? I'm proud of my faith. I was brought up Catholic and I attend Mass. and maybe give us a helping hand to keep it going. is the Docks Cafe, just down the road from the steelworks. I mean, I've got part-time staff. At the moment, we're OK. But what's going to happen next month? just how ingrained steel is in this community. on the back of steel-making here. So there was a lot of money coming through here? -At one time, it was known as Treasure Island. What was it like, back in the day, then? because it's like a small town in there, you know. There is nearly 100 miles of road in there. There's over 150 miles of railway line in there. -It covers an area of roughly 20 square miles. And how many people work there? -they'd come in from Cardiff. It had its own station at one time. How do you feel seeing it as it is now? It's changed a lot. It has changed a lot and that is because of technology. We've increased steel production but we've reduced the manpower. Unfortunately, that is the way. What impact do you think that'll have on this community? It's going to be devastating, absolutely devastating. because we make such good quality steel. when one of their own was seriously injured. Richard Taylor, on the trail of Britain's patron saints. Today, he's walking in the footsteps of St David. Who else? His saint's day is on Tuesday. as Dewi Sant, St David. I'm on my way to the beautiful city that's named after him. from the Roman Catholic Church. keeping the faith against pagan rivals. There are some fantastic stories about David. His birth was predicted by the wizard Merlin. He was a relative of King Arthur. and he cured the sick. on the spot where his cathedral now stands. who spent most of his working life in this little valley. and foregoing all personal possessions. that he became its patron saint? and St David was one of the very best. to make a little hill so that people could hear him even better. Whether Wales really needs another hill is another question. if you can separate David fact from David fiction. Where did his influence come from? I mean, why David as opposed to any other man? so strong that six centuries later, they built this great cathedral. There's something very special about this place. and still find hope and inspiration in this place. Do you think David does lie here? that there may be something contained within the shrine. "and do ye the little things that you have seen me do." more than the usual chitchat with your cut and blow-dry. But first, it's to Southampton for this popular worship song. stylist Anthony Holder-Simms offers more than just a new hairdo. I'm in your capable hands. Make sure you do a good job. confide in them so much that it's almost like a confessional? what's going on with their children, what's going on at work. and a lot of people just break down in front of me. know that there is a God and there is a God in their situation. Anthony had his own mini-church in the room above the salon. so I can evangelise to people about the word of God. when inside, they're bleeding, inside they're down. Like when you have a child - to me, hairdressing is my child. and your heart, soul and spirit sorted out. When you work with people in anything, it's hard. because I'm doing his work. on the morale of Port Talbot and the surrounding area. trying to keep their spirits up with song. his presence here might be described as a miracle. after an accident at the steelworks. Take us back to that day in August, if you don't mind. and I was bashed about a bit. -What injuries did you sustain them? Multiple fractures of my skull. I lost my ear, my arm, though it's back on now. -Who do you think saved you? He says that God saved him. -Who did you turn to? literally on the floor and, um... I didn't have any answers. I have turned everything over to you. and you are forced to find a way through it, really. And...it's made us better people. we feel it's made us better people. he was able to rejoin the choir. When you're up there with the boys now, singing, how do you feel? where it's almost like being back in work. And I find it really... well, absolutely rewarding. -how you can even just be smiling. -I hope I am, I hope I am. -I hope I inspire other people to walk the walk. And that's almost it for this week. My thanks to the community here, for their warm welcome. I really didn't expect anything else. who are full-time carers to their own grandchildren. Until then, it's our closing hymn for Lent. 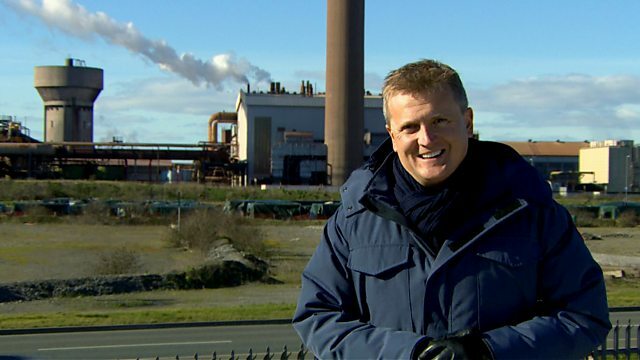 Aled Jones visits Port Talbot, home of Britain's largest steelworks, as 4,000 workers and the wider community await news of hundreds of redundancies. And for St David's Day, Richard Taylor traces the history of the patron saint of Wales. Guide Me, O Thou Great Jehovah performed by Choirs and Congregation of Tabernacle Welsh Baptist Church I Believe performed by Richard and Adam Beautiful One performed by performed by Beechcroft Choir Be Still For The Presence Of The Lord performed by Michael Powell and band All saints of Wales performed by Choir and Congregation of St Davids Cathedral There Is A Land performed by Kenfig Hill Male Voice Choir Courage, Brother, Do Not Stumble performed by St Machar's Cathedral's congregation.